What is the most common correction that you get in ballet class? Chances are, it has something to do with your arms. Rather than just telling you “shoulders down” or “elbows up,” today I am going to show you the single most important exercise that you should be doing outside of the classroom. If you never want to hear your ballet teacher scream at you in front of the class about your arms ever again, please read on! Addressing the real problem – Like I talk about in my other blog posts, strength is the limiting factor (in our extensions and our pirouettes). Sure, we can stand around in ballet class all day long with our arms out in second position but this tends to lead to two things; 1.) Tired, droopy elbows which leads to 2.) Incorrect muscle memory. Over time, after repeatedly holding the arms incorrectly day after day and hour after hour, our bodies (and our minds) get trained to do the wrong thing – to hold the wrong position. The best way to address this situation is outside of the studio. Dancers often lack upper body strength. We spend so much of our time focusing on what the legs and feet are doing that we neglect the upper body. (Core is another neglected component but we’ll get into that at another time.) The dancers that I work with at my studio and online work diligently to balance their upper body strength with the rest of their ballet skills. Some workouts are even entirely for the upper body. Why, you might ask? Because our upper body is responsible for a lot that goes on in our dancing. A turn cannot successfully be completed with droopy elbows, for example, and your jumps clearly will not get far off the ground if you are tensing your shoulders and neck midair. So what exercises should you be doing? I am going to show you one of the single most important upper body exercises that dancers should be doing outside of the ballet classroom. The Pec Fly – The Pec Fly (often referred to as the dumbbell fly) is an exercise that emulates a ballet port de bras that goes from first to second position. The pec fly targets the pectoralis major and minor muscles, the serratus muscles in the rib cage, in addition to the deltoids to help stabilize the movement. What does this mean in dancer terms? It means that it directly targets the muscles that you use to keep those elbows lifted and shoulders down when holding your arms in first position. This means great things for your dancing like stronger turning positions, free moving jumps, and effortless port de bras. Directions: Start lying on the floor, knees bent, feet on the floor as pictured, holding 2 weights (3-5 lbs to start) in a rounded ballet second position. Keeping the arms rounded, slowly bring the arms in to a first position, touching the weights together. 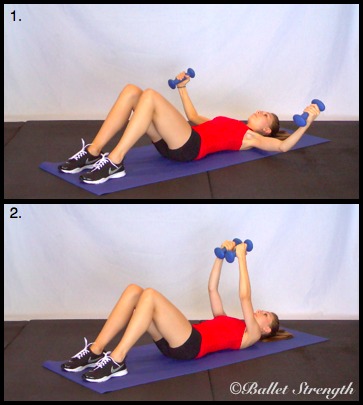 Repeat this for 15 repetitions, rest and do this again for a total of three sets. As always, make sure you warm-up prior to beginning any ballet or fitness routine. Upper body is something that I have incorporated into all of my Ballet Strength online programs and DVD’s as it is a vital component to your progress as a dancer. I go over multiple exercises that will improve your port de bras, just like the pec fly exercise above. Give this a try and I can’t wait to hear how this exercise helps you improve as a dancer! Today’s video is to help you improve your penché for ballet. The penché is one of the exercises in ballet class that dancers struggle with – it requires balance, proper alignment, flexibility, and a strong standing leg. In fact, directors often give penché in auditions to see who can handle it and who topples over. So what can you do to improve your penché? This video demonstrates a Ballet Strength exercise that addresses all of the key factors that go into executing the perfect penché such as balance, flexibility, strength, and alignment. Give it a try! 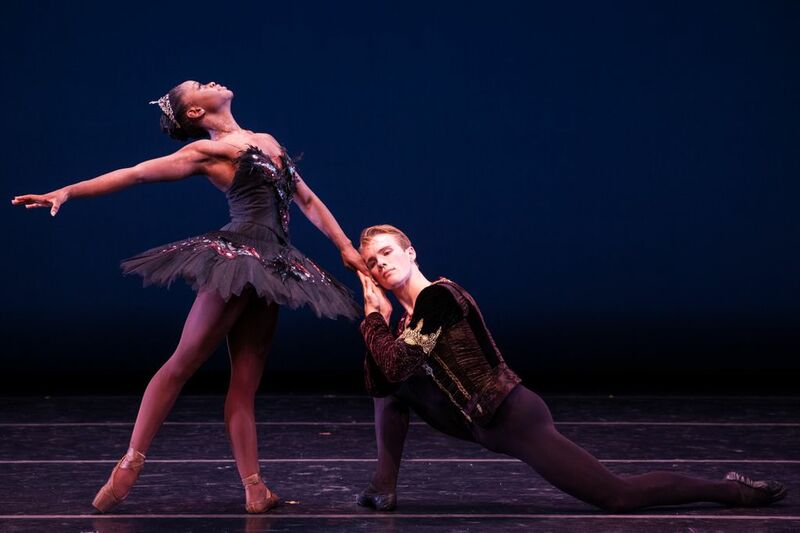 Dance Theatre of Harlem’s Samuel Wilson and Michaela DePrince in Black Swan Pas de Deux. Dance Theatre of Harlem dancer Samuel Wilson is preparing for an upcoming show at the New Jersey Performing Arts Center on January 17th. The show boasts three different pieces from three different choreographers including the well known Agon by George Balanchine and Gloria by Robert Garland. Learn more about Samuel and what he does behind the scenes to stay in top physical condition. When did you know that you wanted to be a professional dancer? The moment I realized I wanted to be a professional dancer was shortly after I started taking lessons. At that time in my life, I had very few aspirations for my future and had many hobbies but nothing that was quite as challenging or rewarding. It was as if a light bulb had turned on in my head and I found what I was meant to do. What struggles or injuries have you encountered along the way? The struggles and injuries I have encountered have been both major and minor. There are always set backs in life and it is no different for dancers. The most difficult part about any injury is that you are temporarily removed from the thing you love most in this world. I have broken my ankle, both my big toes, subluxed my right hand and even sprained my back muscles, which is the most painful of all those injuries. In the end, it is a part of trying to achieve perfection and excellence so it has always helped me to keep a positive outlook on things. With the talk of New Year’s resolutions, what was your resolution this year? With all the talk of New Year’s resolutions I have decided to continue with the same resolutions I have already made: to be a better dancer, person, and friend. There are so many aspects of myself that I will continue to work on and develop. Instead of making a deadline for those things, I wish to take my time and enjoy life as it comes. Also, I would like to go on a cruise with my girlfriend. What do you do for cross training to maximize your performance? What I do during the off season for cross training can vary from day to day. Since our dance season has two major breaks, one in the winter and one in the summer, it is not too difficult to find jobs. During that time, I do as much teaching as I can so I can develop a new skill set that can be used in my future. Along with that, I take long walks with my dogs, or even roller blade with them, and lift weights. I have found that rest is sometimes a good medicine, along with stretching and yoga to maintain strength. Why do you feel that cross training is important for young dancers in particular? I feel that cross training can be good for young dancers because it can help strengthen your weaknesses and prevent you from acquiring injuries related to overusing the wrong muscles. It can also have endurance benefits and help the overall aesthetic of a young dancer’s body. Tell me more about your nutrition and go-to foods for energy: As a male dancer, I find myself eating constantly and with great gusto. My go-to foods are pretty healthy in nature (not fried) such as meat, vegetables, fruits and whole grains. I find that without foods, such as carbs and protein, I get very hungry and cranky. When I eat I also live by a rule, “If I wanna eat it, then I am going to eat it!” When I am eating a dessert, I just eat less of what I want and I am less likely to snack on other things. What did you learn on your own that you wish someone had taught you as a young dancer? What I learned on my own that I wish someone had told me when I was young is that as a dancer you need to be patient. I always wanted things to happen so fast for me: to be a principal dancer in just a year or be given the roles I want because I work hard and hold myself to a high standard. The thing is, there is so much more to what we do than being out front all the time or getting the parts you want. I have fallen in love with some of the steps I do on the side and have detested some of the ballets where I am in a central role. There are also moments I enjoy being in the spotlight, as well, and now I relish it because it was earned over time and never just handed to me. You have an upcoming performance at the NJPAC – tell me more about this: We have an exciting program coming to NJPAC on the 17th! We will be doing a repertory show, including works from three different choreographers. The program will have something for everybody, such as the deeply spiritual Gloria by Robert Garland or the quick and assertive Agon by George Balanchine. Sandwiched in the middle is a love story of a different kind that has all the roller coaster of emotions you would find within the minds of timid lovers. I expect it to be an event the audience will not soon forget. What words of advice do you have for young dancers? The words of advice I have young dancers are to keep persevering. You must continue to give all you can and what you will get in return will always be worth it in the end. Take your time and enjoy dance while you still have it. Remember that you are blessed to be able to create art every day and that you are an individual with your own story to tell. You can see Samuel Wilson and the rest of Dance Theatre of Harlem at the NJPAC on Friday, January 17, 2014 at 7:00 pm. For tickets and pricing visit ticketmaster.com. The New Year starts tomorrow – have you set your goals or resolutions for the year? When we think of the “year” as dancers, we tend to look at it the way we look at the school year, September through June. While the start of the school year is a great time to set new goals, this doesn’t mean that you can’t set new goals starting January 1st! The following are some goals and resolution ideas to help you out in 2014! Resolution #1: Write down your corrections – You are more likely to actually improve and apply corrections if you write them down. Take notes of what your teachers tell you and look back on those notes every few weeks. Resolution #2: Stretch – Stretching is an essential part of your muscle recovery at the end of the dancing day. Make it a habit to stretch before bed each night so that you feel refreshed and ready to go in the morning. Resolution #3: Limit negativity – As dancers we sometimes become perfectionists. This perfectionism can sometimes put us in a negative place mentally. Do your best to think positive thoughts and seek solutions rather than complaining about them. Resolution #4: Help others – Is a friend having difficulty picking up choreography? Help him or her out. Going over the choreography with your friend will also help you learn it better. Plus helping just feels good! Resolution #5: Nail those auditions – Be confident and nail those summer intensive auditions this year! Showcase your best by looking the part and acting the part. Did I give you some ideas? Now sit down and start writing out your detailed New Year resolutions for a successful 2014 dancing year. You’ll be glad that you did! Today we are going to talk about the shoulders and how a little bit of Ballet Strength training for the shoulders can help improve your port de bras, enhancing your partnering skills. Your port de bras is not only an important part of your daily ballet class and performance – it effects your partnering skills too! If you have weak arms you will have trouble executing simple partnering skills like finger turns, promenades, and arabesques. The exercise we are going to do today is called the overhead press. The overhead press primarily works the entire shoulder and front deltoid muscles with the triceps as the secondary muscle used. The idea is to strengthen the shoulders in the overhead position which will in turn help tremendously with finger turns. Give this exercise a try with light weight such as 3-5 pounds weights to start. Start with 10-15 repetitions performed three times. Add this exercise to your ballet cross training routine and notice a difference on your placement in class and your strength/balance in partnering class! As always, be sure to check out my Ballet Strength training programs for more detailed exercises. I have coined the phrase #TenduTuesday in the dance world and every week it makes me think about just how much we use the tendu in dance! The tendu is used in preparation for many of the turns we do in class and on the stage; soutenu turns, pique turns, simple pirouettes. As you know, the preparation can make or break the step that follows it and the tendu is no exception. If your tendu before a pique turn or pirouette is out of placement, you turns will definitely suffer. Practice perfect placement this Tendu Tuesday and watch your turns improve tremendously! Breaking Pointe – Human or Dancer? As a former professional ballet dancer, I admit that it is exciting to see a ballet reality TV show such as the CW’s Breaking Pointe getting so much attention. I support the show and the dancers who are opening up their lives on camera to give the public some insight into a dancers life. The tough part is seeing dancers whom I trained with or worked with in the past getting so much criticism from the dance community – particularly from ballet moms. Here’s a quick reality check. If everything was just sugarplums and tutus, there wouldn’t be a show. As perfect and innocent as ballet may seem, you have to realize that dancers are human and are in fact very much like you – They don’t get along with all of their co-workers, they have bad days, they have self-esteem issues, they deal with work stress, they have to compete for job promotions. Yes, occasionally they even meet up at the bar after a long day of work. Isn’t this what most of the general public has been doing their whole adult lives? These dancers are men and women working to make ends meet just like you – they don’t live in a music box. The other thing that the public doesn’t realize is that these dancers are Adults. The public tends to associate the word “ballerina” with a little girl when in fact these ballerinas are professional adults. The truth is that while you were off at college joining fraternities and sororities, dancers were already working. Most dancers are hired into professional companies at age 17, forcing them to grow up at a much younger age than you. Now that’s reality. Why don’t they show more dancing? Because dancers lives encompass more than just dancing. Breaking Pointe is trying to make the public realize that dancers are human beings dealing with many of the same social issues as you – look at the African American dancer in the company, the openly gay couple, the dancer dealing with the stress of starting a family and marriage, the dancer who’s husband doesn’t have time for her. These are very big issues that people are dealing with all over the world every day. Why do you demand that a dancer’s life be any different? The show depicts a wonderful contrast between the dancer’s personal lives and their studio lives. Have we created a false sense of reality for our teens when we don’t allow them to watch Breaking Pointe because it addresses too many real issues? If you want to see dancing and be swept away from reality buy tickets to see the ballet! In the meantime, watch Breaking Pointe for what it is – a real look into a hard working professional’s life and the hardships and glory that comes with it. Let’s applaud these dancers with a standing ovation for opening up their lives to us! What does it take to get into a ballet company? Many of you may be asking yourself this very question right now as you embark upon a summer intensive program in hopes of being accepted into the company or trainee program for the 2013/2014 season. Let’s face it, you have competition and while summer intensives are for learning, they are also a great test of your fight – will you stand out and impress or try your hand in the back of the room? It comes down to two things from what I have seen and experienced – Are you technically sound or are you a one trick pony? Let me explain. While every company is different in terms of style, there are a few truths that you just can’t ignore. There are those who can developé their leg past their ear, those who are barre technicians, those who have feet so arched that they can’t actually stand up in center, and then there are those who are balanced. Where do you want to be? You know the answer – You want to be a balanced, well rounded dancer. Ballet company’s are not looking for acrobats nor are they looking for feet so arched that they are dangerous. They want dancers who have a strong base, are easy to work with, will not get injured at the first opportunity that comes their way, and who have a good work ethic. They are looking for strong technique and the ability to perform well when it counts. Directors want to be able to use their dancers in multiple ways and they need versatile dancers to keep up with the demands of contemporary choreography. Chances are, your friend who has gotten this far only because she is good at adagio will be skimmed over for someone with a little more usefulness. The same also goes for the lazy but talented dancer who’s heart just isn’t in it. Showcase your strengths, but show that you are willing to work hard in all areas of dance, try new things, and do it with an open mind. Afterall, if you are chosen to represent the company as a dancer, apprentice, or trainee the director wants to know that you will be likeable and can take correction and direction well. This summer “trial run” for a position in the company next year is a test to see what your work ethic is like. Will you work your way to the front of the room and present yourself as the next company dancer? 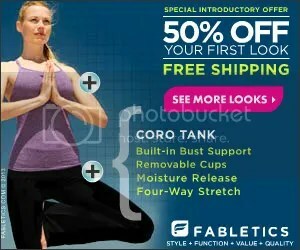 Making sure that your core is strong is an essential part to your performance as a dancer. The following are three exercises that you can do to strengthen your core for turns, jumps, balance, and technique! Click on the photo below for a larger version or to print it out! Ball Crunches- On a balance ball, perform 3 sets of 15-20 repetitions being careful not to pull on the neck. Oblique Twists- Sitting on a balance ball, contract the navel to the spine. Twist side to side holding a weight or weighted ball. Perform 15-20 repetitions. Side Plank- Balancing as pictured above, hold this position for 15-30 seconds. As always, be sure to use your best judgement when performing these exercises to your personal fitness level.